The sun star Solar system, around which revolve all of its planets. In comparison with the Earth size and mass of the Sun can without exaggeration be called a tremendous. The sun is a star, the surface temperature of which reaches several thousand degrees, so its light, even after going a great distance to the Ground is too bright to the Sun you can see with the naked eye. Therefore, the size and shape of the Sun, the common man is rather difficult to assess. 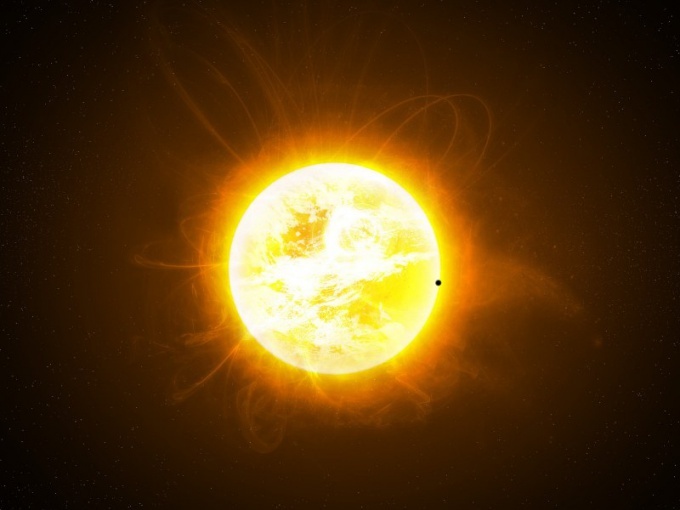 However, scientists-astronomers established that the Sun is a ball that has almost the right shape. Therefore, to evaluate the size of the Sun, you can use the standard indicators used to measure the size of the circle. Thus, the diameter of the Sun is 1,392 million kilometers. For comparison, the Earth's diameter is only 12 742 kilometers: thus, by this measure, the size of the Sun exceeds the size of our planet in 109 times. The circle of the Sun across the equator reaches of 4.37 million kilometers, whereas for Land this figure is only 40,000 km, in this dimension the size of the Sun is greater than the size of our planet, in the same number of times. However, due to the huge temperature on the surface of the Sun, which is almost 6 thousand degrees, its size is gradually reduced. Scientists involved in research of solar activity, say that the Sun for each hour is reduced in diameter at 1 meter. Thus, they assume that a hundred years ago the diameter of the Sun was approximately 870 kilometres more than at the present time. The mass of the Sun is different from the mass of the planet Earth even more dramatically. According to astronomers, at the moment the mass of the Sun is about 1,9891*10^30 kilograms. The mass of the Earth is only 5,9726*10^24 kilograms. Thus, the Sun is heavier than Earth by almost 333 thousand times. However, due to the high temperature at the surface of the Sun, most of its constituent substances are in the gaseous state, and thus have a relatively low density. So, 73% of the stars have hydrogen and the rest helium, who is in her part of the order of 1/4, and other gases. Therefore, despite the fact that the volume of the Sun exceeds the corresponding figure for the Earth more than 1.3 million times, the density of this star is still lower than that of our planet. Thus, the density of the Earth is about 5.5 g/cm3, whereas the density of the Sun is about 1.4 g/cm3: therefore, these figures differ by about 4 times. Newton called mass the quantity of matter. Now it is defined as the measure of inertia of bodies: the heavier the object, the harder it is to accelerate it. To find the inert mass of the body, compare the pressure exerted by them on the surface of the support, with the standard, introduce the scale of measurement. To calculate the mass of celestial bodies using gravimetric method. All bodies possessing mass, excites in the surrounding space of the gravitational field, just as electrically charged particles form around themselves an electric field. It can be assumed that the bodies carry a gravitational charge, similar to electric, or, in other words, have a gravitational mass. With high accuracy it was found that inertial and gravitational mass are the same. Let there be two point bodies with masses m1 and m2. They removed from each other on distance r. Then the force of gravity between them is equal to: F=C·m1·m2/r2, where C is the coefficient which depends on the selected measurement units. If the surface of the Earth has a small body, its size and weight can be neglected because the dimensions of the Earth are much greater. When determining the distance between the planet and the surface of the body only considers the radius of the Earth, because the height of the body is negligible in comparison with him. 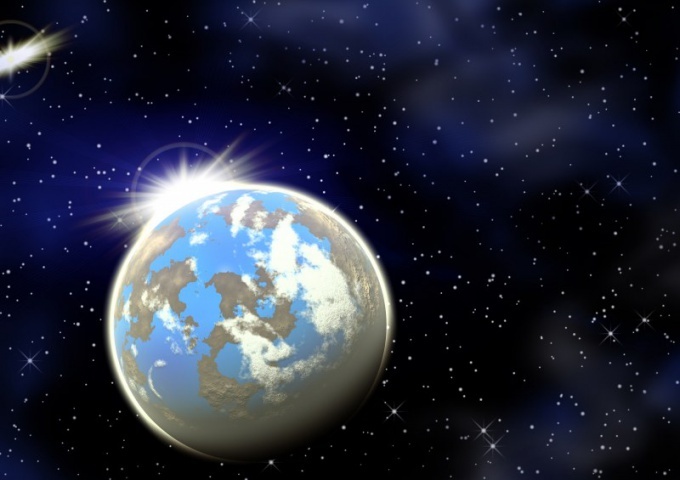 It turns out that the Earth attracts a body force F=M/R2, where M is the mass of the Earth, R – its radius. According to the law of universal gravitation, the acceleration of objects under the action of gravity on the surface of the Earth is: g=g•M/ R2. Here G is the gravitational constant, numerically equal to approximately 6,6742•10^(-11). The acceleration of gravity g and the radius of the earth R is from direct measurements. The constant G with a high accuracy in the experiments of Cavendish and Jolly. Now, mass of Earth M=5,976•10^27 g ≈ 6•10^27 g.
The gravimetric method is applicable currently only to Land, since in its progress it is necessary to make measurements from the surface studying the planet. Knowing the radius of the Earth, it is easy to find its volume. It's roughly equal to 1121 billion km3. From volume and mass is the average density, by the formula ρ=M/V (ρ is the density, M – mass, V – volume). For the Earth density is about 5.52 g/cm3.